Signature "bäco" flatbread sandwiches and much more from chef/owner Josef Centeno. : This chic, quirky neighborhood spot in downtown’s Old Bank District is a hot destination for the compelling cooking of chef/owner Josef Centeno, whose downtown empire has expanded to Bar Amá and the upscale Orsa & Winston. A lively, urbane crowd packs the handsome, industrial room and sidewalk patio every night --- reservations are a must, though you could luck out with a seat at the hopping bar. Rock ‘n’ roll elevates the noise level, but undoubtedly some of the chatter is about the food. 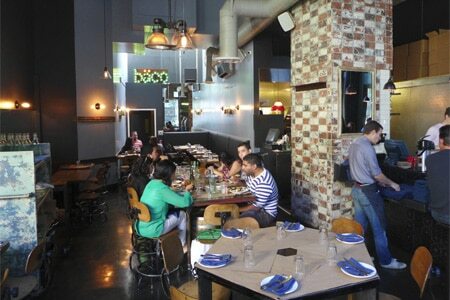 The restaurant is named after Centeno’s seductive signature flatbread sandwich dubbed the "bäco." The original combines fatty pork and beef carnitas, arugula and a Catalan salbitxada sauce, but other versions feature beef tongue schnitzel, oxtail hash and chicken escabeche. Dishes are Spanish-leaning, but driven by Centeno’s creative, eclectic culinary voice. The long list of inventive vegetable tapas is not only a boon to vegetarians, but some dishes --- beets with yogurt, sumac and hazelnuts, a Brussels sprout “Caesar” and caramelized cauliflower with mint and lebni --- are good enough to attract converts. Explore decent artisan cocktails, interesting European boutique wines and a good selection of high-end whiskies. Desserts include chocolate cake with peanut butter cream and semifreddo, and pineapple upside-down cake.